This invitation demonstrates a growing interest in Buddhism in China among the Chinese scholars, particularly in Tibetan Buddhism and its relation to Chinese Buddhism. Towards the end, all the scholars expressed a desire for Master Tam to return as a visiting professor. As a result, The Sino-Tibetan Buddhist Studies Association in North America (STBSA) and the school of Chinese Classics at the Renmin University of China was establish the Centre for Sino-Tibetan Buddhist Studies in June 2008. The goal is to establish Renmin University as one of the major international centres in Buddhism studies. This historical event marks the beginning of a cultural and international collaboration between Chinese and Canadian scholars to promote academic exchange on Buddhism Studies. It is the first academic Religious Studies collaboration of its kind. Although Tibetan Buddhism, particularly Indo-Tibetan Buddhism, is a popular research area in the West, its relationship with Chinese Buddhism is often neglected. The mission of the Institute is to train a new generation of scholars in China, especially at the doctoral level, in Sino-Tibetan Buddhism. These scholars will help promote awareness of this growing field of studies, both within China and internationally through research and mentorship. The study of Sino-Tibetan Buddhism will offer a unique perspective which will complement the existing body of scholarly work in the field of Buddhist Studies, as well as new insight into Tibetan and Chinese Buddhism. 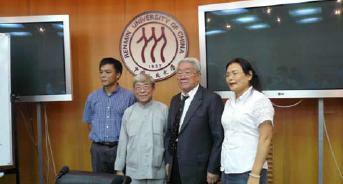 This partnership, headed by Master Tam Shek-wing, provides most of the initial academic resources for the Institute. Master Tam, a Canadian, is an internationally recognized scholar in Sino-Tibetan Buddhism, and is the academic consultant for the Monograph Series on Sino-Tibetan Buddhism. For the past four years, the partnership has given rise to many opportunities for further international partnerships in Buddhism research. Up until now (June 2012), eleven students have begun their PhD or post-doctoral research in Germany, France, Japan and the United States. The result is indeed encouraging.